Pretty Eyes, Electric Bills creates a space for the exhibition of emerging artists in the fields of painting, installation and sculpture. Using post-minimalist sculptors and pop abstraction painters as influences, these artists adopt the referential behaviors of real objects to frame their abstract works’ imagery and/or physicality. 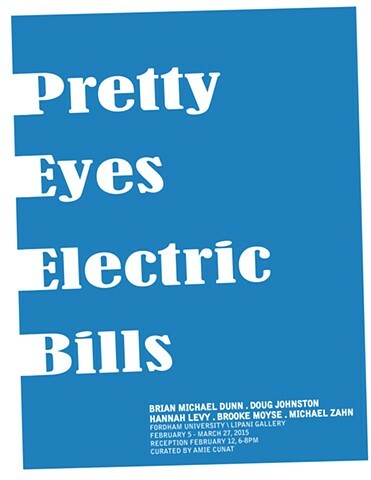 Like Ed Ruscha, whose appropriation of American vernacular, conveys his engagement with pop cultural dissonance through textual means, the artists in Pretty Eyes, Electric Bills use banal items as visual influences to recontexualize our experience with the everyday through their work. Among the pieces in the exhibition, choices to reveal, obscure, appropriate, and compress their visual sources are at play. A significant issue the exhibition addresses is tactility. What I mean by tactility in contemporary art is the preoccupation among certain artists in developing work that connects the viewer with its perceivable sense of touch. There have been two repeating, prevalent concerns in both my classroom and among my peers: digital technology as well as provisionality in art making.1 What connects both is their active denouncement of tactility. In a recent interview with the Museum of Contemporary Art Chicago, William J O’Brien, a fiber and installation artist, discusses how “tactility is almost radical now, because it requires a rudimentary rejection of technology.”2 Pretty Eyes, Electric Bills, responds to these concerns by presenting artists who have developed acuity in their craft, and subsequently, a tactile condition. The title of the exhibition is borrowed from Ed Ruscha’s, Pretty Eyes, Electric Bills (1976); a drawing whose idiosyncratic phrase depicted through authoritative typography asserts the potential of irony between textual and visual languages. Similarly, the agency behind Ruscha’s decisions to juxtapose words of conceptual discord, frame the curation of the objects and paintings in this group show. Their incongruous affects form an alternate dialogue. 1. Rubenstein, Raphael. “Provisional Painting”, Art in America (2009), There has been recent attention given to “provisional” or “casual” work, particularly in painting. The provisionality in paintings (and other disciplines) emphasizes the tentative or low-key process by which they are made.